Spider-Ham's World: Beyond the Ringside: Why Can't Arnel Pineda Sing Lupang Hinirang Correctly? Beyond the Ringside: Why Can't Arnel Pineda Sing Lupang Hinirang Correctly? I won't be talking of stories how Manny Pacquiao defeated Joshua Clottey by unanimous decision. There are just too many blogs and sites that will talk about it. Let's just check what happened Beyond the Ringside that last Sunday, March 14. I was able to get a live stream broadcast of the main event. 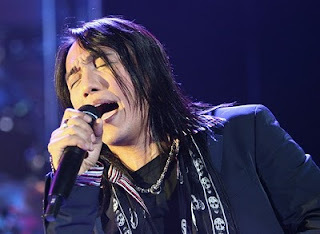 I was surprised to see Arnel Pineda to sing the Philippine National Anthem, not only is he a Filipino artist but he is also recognized as member of the rock band Journey. I have always wanted to watch this part of Manny Pacquiao's event, how will our local artists sing Lupang Hinirang. I was so disappointed when Arnel Pineda changed the last line's tune to a higher note instead of the original one. Another artist will be included in the long list of people who cannot sing the national anthem correctly. This is just a simple thing you need to do, to sing it correctly and you were not able to do it properly. If these simple rules cannot be followed, how much more can we hope these people to obey the law. It's like they're saying "Hey! I am an artist, I give prestige to the country. I can do whatever I want!" No wonder why Freddie Aguilar gives negative comments against him for not being proud as a Filipino. I hope the National Historical Institute (NHI) and the National Commision for Culture and Arts (NCCA) will do something about this. I wish they don't just have a press conference and tell the media that they condemn this act and they will ask for that artist to have a public apology. Public apology from these artists who think they can do anything? I don't think so! The law should have at least a more strict policy, rules or guidelines for these artists singing our national anthem especially if they're going to sing it abroad. We don't want to hear our national anthem sang by school children the way our artists is singing it today.